Dog Fighting – Who Is Going To Jail? Every success in the world of animal abuse and cruelty is worth a standing ovation and the outcome of this case for the ASPCA in New York must be sweet. 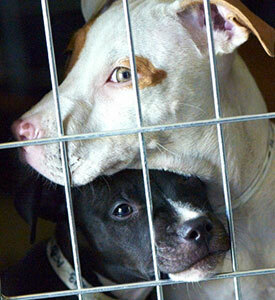 In June of 2012 a dog fighting operation was raided by the ASPCA. The dark, windowless basement of a 6 story apartment building in The Bornx was home to 50 dogs – aged 12 weeks to 5 years of age. The building superintendent – Raul Sanchez was charged with animal fighting which is a felony. There was a dog fighting arena in the basement large enough for 100 spectators. Rough wooden crates and the equipment associated with dog fighting such as treadmills, muzzles, harnesses, syringes and raw meat were found. There was also a .25 caliber handgun on the premises. Organized dog fighting such as this is violent and brutal animal abuse. The torture and exploitation of the dogs is extreme. Fast forward to February 11, 2013 and Raul Sanchez is going to prison. His sentence which will be served concurrantly. 1 to 3 years for animal fighting. 1 year for animal cruelty. 1 year for possession of a weapon. This is just a start. The sentences are not tough enough. How about 10 years in prison with no possibility of early release. A $250,000 fine. A lifetime ban on owning animals. That might make some people think twice about operating a dog fighting operation. Until criminals are shown “real” consequences – the frequency of this crime will not change noticeably – there is just too much money to be made. So sign petitions and share links when you can because awareness is essential.